This article provides an overview of the Auto Attendant number. Your new Hosted PBX Automated Attendant gives you the capability to help your callers reach the people or information they require quickly and easily, 24 hours per day. Hosted PBX Automated Attendant greets your callers with a set of options that correspond to keys on the telephone keypad. Based on the options you present to your callers, Hosted PBX Automated Attendant can route calls to specific people, groups of people in order or at the same time, provide outgoing information and much more. Your Hosted PBX Automated Attendant number can even become your fax number. This tutorial will guide you through the process of setting up your new Hosted PBX Automated Attendant to meet your specific business needs. As you use this tutorial to learn about the various features of your Hosted PBX Automated Attendant and how to configure them, you will need to develop an idea of how you want the system to answer your calls and which options you want to provide to callers. How will your Hosted PBX Automated Attendant route calls? Which people within your company do you want to be reachable through this Hosted PBX Automated Attendant? What outgoing information do you want to provide to callers? Do you want callers to be able to Dial by Name or Dial by Extension to reach employees? Will you want different options played to callers after hours? Will it be necessary to create a Weekly Schedule that automatically activates different Menus based on time of day and day of week? In order to set up and manage your Hosted PBX Automated Attendant, you must log in. Once logged in, you will be able to set up and modify your Hosted PBX Automated Attendant, listen to voicemail, view faxes, and manage other aspects of your service such as changing your PIN, and viewing your billing and call history. Additionally, you may access several features of your Hosted PBX Automated Attendant such as voicemail and faxes through any touch tone phone. Enter your PIN over the initial ring or the greeting (either the temporary, system- generated greeting or a greeting you have previously recorded). Once you have entered your PIN, you are in command mode where you may listen to voicemail, access Faxes and record greetings. Your Hosted PBX Automated Attendant can direct your callers to any phone number, the outgoing message, additional Menu, or group of phone numbers. Your Hosted PBX Automated Attendant has the capability to provide your callers with outgoing information (Bulletins). You create and record these Bulletins, which are then played to callers in association with specific Menu choices that voice the recordings. -A Bulletin allows a pre-recorded message to be presented to the caller along with up to 3 options. It is typically used as a child of the main menu. -An example of a common use case for a Bulletin is hours and location for a business. A caller can be presented with the option to "press 1 to hear our hours and location" from the main Auto Attendant menu. Pressing 1 will route the caller to the appropriate Bulletin, and the Bulletin will play the pre-recorded greeting. The caller can then select from the options set within the Bulletin to perform another action. Such as, "press 0 to return to the main menu". Or, "press * now to leave a voicemail". NOTE: Remember while recording the Bulletin greeting to inform the customer of what their button press options are. Hunt Groups are ideal for delivering calls to a group of phone number either at the same time, or in a specific order. In an Ordered Hunt Group, a caller is placed on hold with music while the system rings the numbers for phones that are in a list one at a time, in a specified order. The first person to answer a ringing phone is connected with the caller. A simultaneous Hunt Group places the caller on hold with music and rings all the phones in a specified list of numbers at the same time. The first person to answer any of the phones is connected with the caller. Note: Hunt group will be considered active as soon as it will be added to an active Menue/Bulletin/another Hunt Group. It can be added as one of the menu options or/and timeout setting for the menu. Members are the DPS phones that are assigned to a Call Queue. The minimum is 1, maximum 300, default 30 seconds. Minimum 0, maximum 600, default is 120 seconds. The length of time that members will ring according to their hunt type, before sending the caller to the queue holding pattern. The length of time the system waits before playing the Repeating Queue Interval recording again. The maximum amount of time that a caller may hold in the queue. After the Queue Timeout expires, the caller will hear the Queue Timeout recording, and then will be directed to the queue’s timeout action. The maximum number of callers that may be holding in the queue at once. All recordings may be set to “No Recording”, “System Recording”, or “Custom Recording”. 11. Call Queue Keypad Options. Call queues can be programmed with options that the caller may press to perform different actions, essentially allowing them to “escape” from the queue and be routed somewhere else. This determines where a call will be directed if the caller has already held the line for the defined Queue Timeout time. From Auto Attendant control panel, navigate to Queue Members and select Log In or Log Out for the appropriate agent. From a queue member's individual control panel, navigate to Queue Availability and select Log In or Log Out. From a desk phone, dial *25 to log in or *26 to log out. Wait for the confirmation message to play. Dial by Extension is ideal for helping callers reach specific people within your company, providing the callers know the Extension of the person they wish to reach. There is another type of extension that can be created in your Auto Attendant - Virtual Extension. Through the use of the AA's built-in Dial By Extension feature. Any other context in which the call is not being processed through the Auto Attendant. To exit the Dial By Extension directory and go back to the previous menu, press '#' by itself. Specify a 3-digit number for the Virtual Extension. Valid options are 100-899, excluding 311, 411, 511, 611, 711, and 811. Choose the destination: you can send calls for this extension to either a phone number or to the Auto Attendant voicemail. Provide a first and last name for this extension ( these fields are used for Dial By Name). Dial by Name is ideal for helping callers reach specific people within your company, providing the caller knows the last name of the person they wish to reach. To exit the Dial By Name directory and go back to the previous menu, press '#' by itself. To record a name to be stated once chosen please do the following. First, dial the auto attendant number then put in the pin over the first ring. You will then hear a menu choose option 8 for user options. You will be greeted with another menu choose option 2 for directory names. Type in the desired extension number to record the name for. Press 3 to record press 2 to review the name and press # when finished. 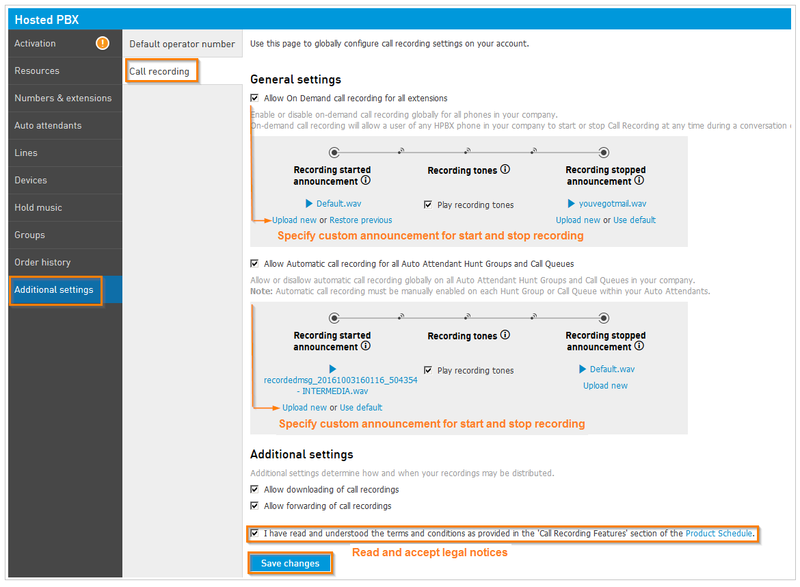 Extensions that are available through the Dial by Name or Dial by Extension options can be adjusted by checking or unchecking the box found at the far right of the Extensions page. Unchecking this will prevent callers from being able to dial these specific extensions or names. The Weekly Schedule allows you to automatically activate specific Menus at predetermined times and days. You may want to present one Menu during business hours, and a different one after hours and on weekends. The Weekly Schedule will automatically activate the Menus you specify at the time and day of the week given for each Menu. Note: all times in the Weekly Schedule are in your local time zone. Once you have configured your Auto Attendant, you must record greetings for the various Menus and Bulletins you have set up as well as record names for the various extensions (if you intend to use Dial by Name). The following instructions provide you with the steps to record your greetings via the phone and the Web. If you need help with what to say in your greetings, click the Script button associated with each Menu or Bulletin. The script contains not only the instructions but also the information about the options which your greeting should contain. Repeat these steps for each greeting you wish to record. Save the file as a .wav or .au file. Go to the Menu or Bulletin you wish to upload this greeting for. 4. Repeat these steps for each Menu or Bulletin. The file name must not contain spaces! 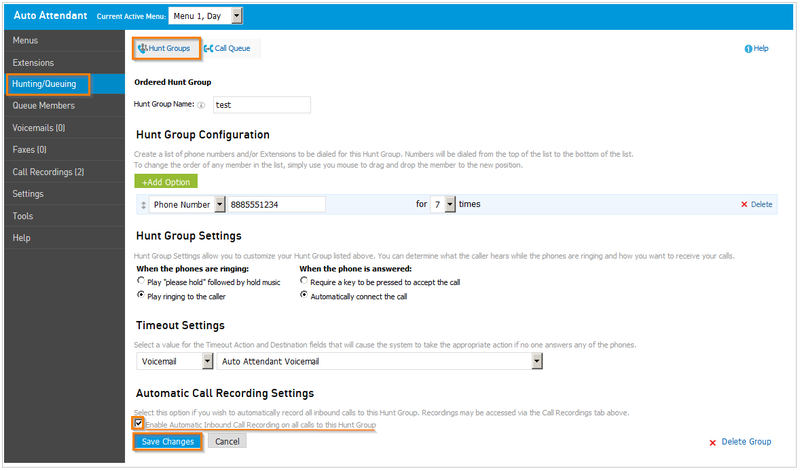 •Enable or disable to download and forward call recording. You can delete, forward, download the recordings. To save you time and increase your efficiency, your Hosted PBX Automated Attendant has the ability to notify you of new voicemail and faxes. Notification is available via pager, email, or digital cell phone. Once logged into the Auto Attendant, click the Personal Info tab > Notification > Enter the email address you want notifications sent to > Choose the format of the notification > Use the test button to send a test notification. Your Auto Attendant has a capability of receiving faxes. If you would like to disable this feature please contact Customer Support. This service will ring all phones internally or can also be configured in such a way to send inbound calls to an external phone or just a single extension.